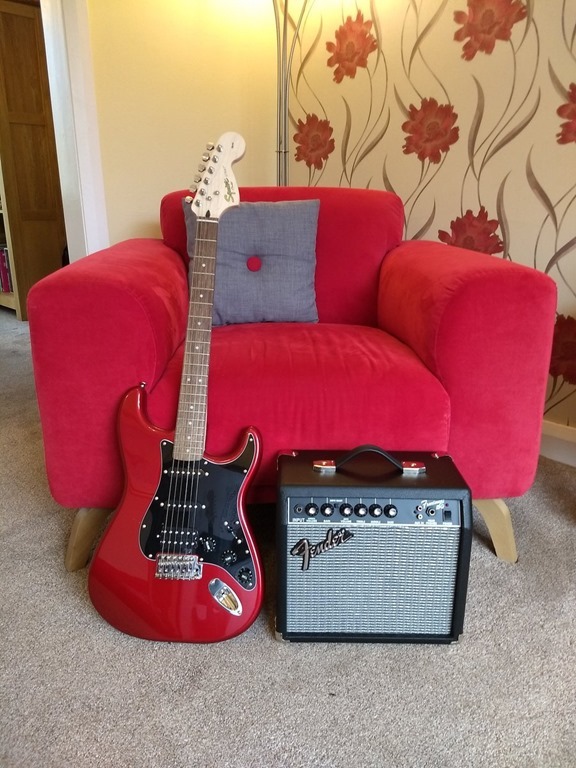 Perhaps I’m having a mid-life crisis, or perhaps it is the appearance of slightly paunchy, balding rock heroes of my youth at Glastonbury or maybe it is just that my son has started guitar lessons, but I have bought a guitar. I’ve never played a musical instrument, I don’t count the obligatory recorder of the 1970s which every child abused. It turns out this post is going to be a bit of a “gear” post. 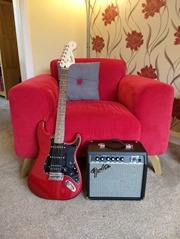 I got a Squier Affinity Series Stratocaster HSS from Dawsons music in Chester. Squier is Fender’s cheaper brand, introduced so that they could make some money instead of other companies making it on their Stratocaster knock-offs. 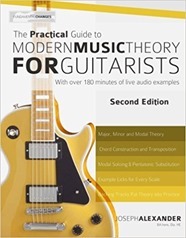 Included in the pack are the guitar, an amplifier and some plectrums. I have to say I’m pretty impressed by the build quality. The inclusion of the amplifier makes it a pretty weighty package so don’t plan on walking home with it! Starting on an electric guitar seemed to surprise some people, I don’t believe it’s a particularly odd choice. 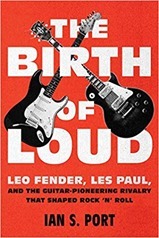 A starter electric guitar is a bit more expensive than an acoustic but you have the motivation of becoming a rock God, rather than the nun from Airplane! I thought maybe I could practice more quietly by plugging in headphones but in the end that hasn’t mattered. Shortly before buying the guitar I’d done a little strumming on my son’s three quarter size acoustic guitar and got Justin Sandercoe’s Beginner’s Guitar Course, attractive since it comes ring-bound. I also got the accompanying Songbook. You can try out Justin’s lessons for free on his website. 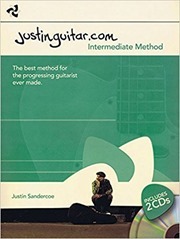 I’ll probably review the books in another post but I came to them because Googling for guitar lessons brings him up fairly high on the rankings, he explains things well (check out some of his videos) and is clearly a popular choice for guitar lessons. I got a headstock tuner – this is a little device that clips onto the guitar headstock and helps you tune up. The steel strings on my electric guitar seem to stay in tune for a few days, whilst acoustic, nylon strings need tightening up most days. There are any number of smartphone apps which will fulfil the same purpose but the headstock tuner is more convenient, and I suspect more accurate. I also got a capo, which is a clamp that goes across all the strings of the guitar and can therefore change the tuning – I haven’t used this much yet. My tuner turned out to be a little too cheap and I’ve had to fix it with superglue. On my list of things to get are are equipment for changing guitar strings, apparently not required until about three months in and guitar strap locking washers (which I don’t need for now since I play sitting down). I’m sure other gadgets will be tempting me, and I notice that people seem to rarely own just one guitar! I also got some headphones, playing with the amplifier on low is fine but you tend to hear the direct noise of the strings which isn’t particularly pleasant, and now I have a tiny amplifier that plugs straight into the guitar and on to the headphones, and a music stand. Fortunately guitar gadgets are cheap compared to SLR camera lenses! The thing they don’t tell you about learning to play the guitar is the pain in your fingers. Oddly, non-guitar players assume this is in your strumming hand. It isn’t. The problem is with your fret hand, which has to hold down thin wires quite hard. Asking for protection on online forums gets you the same response as asking a beginners question on a computing forum. You get called useless and are given no help. Three weeks in and I have callouses on three fingers of my left hand, and the pain is much reduced. I suspect there will now be a series of blog posts on matters musical and guitar.